28th Aug 1964, After playing a show at Forest Hills Tennis Stadium, New York, The Beatles met Bob Dylan for the first time at The Delmonico Hotel. Dylan and mutual journalist friend Al Aronowitz introduce the Fab Four to marijuana. Who was playing that show ? Bob Dylan ? How I wish I had been there, but...*sighs*...one can only dream. No, it was a Beatles show. One of the great days in musical history! Thank you , I never heard about it before and now I couldn't find anything in Youtube. Dumb article. As far I as I know, nobody has ever framed the meeting as a "coincidence", and it's no less significant a summit for being entirely planned, anyways. How did the "celebration" go last night, von? To be honest, I had a long working day (left the office at 8) and was too tired to do much more than watch "Mad Men" DVDs for a few hours. I don't think I would've even made it to the liquor store before it closed at 9 had I tried! Just before midnight, I ritually inhaled a single token lungful of the dread smoke, (uh, DON'T DO DRUGS, KIDS!) and symbolically played a few period-specific Beatles tracks (their first few post-pot recordings), then considered playing some Bob but wasn't in the mood, so I played Cecil Taylor's "Steps" instead. (It has nothing to do with Bob or the Beatles and is in fact from 1966 (whatta great year!) but is awesome.) Then I went back to my DVDs until bedtime. The end. I figure between 1964 Beatles, fictional 1960s Manhattan ad-men, and 1966 avant-garde jazz, I got a reasonable dose of 1960s nostalgia. Article - Did Dylan really get The Beatles high? Exploring this vein of brilliance, it's only natural that Bob Dylan comes to mind. The American singer/song writer had, and still has, huge success of his own and had a strong musical/lyrical influence on the Beatles. Paul McCartney once said that Dylan’s second record ‘The Freewheelin’ was ‘all they played’ on the Beatles tour bus. Paul also said that Dylan was the one who introduced the group to smoking weed. While the Fab Four debuted in 1960 with a squeaky clean image, over time they evolved into more a psychedelic and over all much more interesting outfit. But were the Beatles as ‘clean’ as their image suggested? Did Dylan really get The Beatles high? Before the deed was done, they secured the hotel room; blinds were drawn and bathroom towels were placed carefully along the floor by the locked doors. The first joint was rolled by Dylan and then passed to John Lennon . 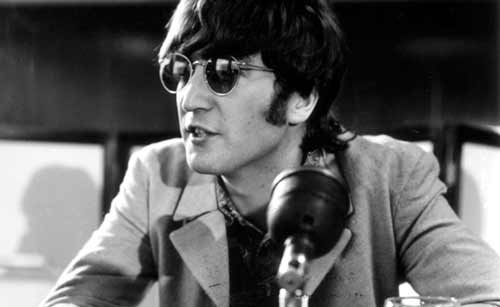 Lennon passed it to Ringo, who finished the joint without knowing that the etiquette was to pass it on. The next few hours were party time for the Beatles as they smoked dope, drank the ‘cheap’ wine (surely millionaire Dylan could afford at least mid-range wine?) and became generally intoxicated. Finally, all smoked out and fatigued from laughing, the Beatles aired out the room and room service was called to clean up the mess. Although The Fab Four didn't fall under the spell of marijuana immediately, after a few months the act of meeting in their hotel rooms and lining towels by the door became a ritual; very much part of their life on the road. And who can say they didn’t deserve to unwind and find inspiration from a plant after long high pressure shows and legions of stalkers tracking their every move. It was again Paul who remarked, many years later, that “we were kind of proud to have been introduced to pot by Dylan. That was rather a coup.” I have no way of knowing if this is an accurately reported statement, or simply the invention of a bored journalist in some obscure office, but it’s intriguing nonetheless. So, did Dylan really get the The Beatles high? Well, as Dylan’s organist Al Kooper puts it, ‘I stopped believing the stories of musical history once I was in them.’ There has no doubt been fabrication, mythology and out right lying surrounding both Dylan and The Beatles, but I guess if Paul McCartney said it, and he, Ringo and Dylan are indeed the closest we’ll get to factual sources on this matter, then we can perhaps assume the answer is yes. ‘Yes’ is certainly the most fun answer. Let’s stick with Yes.